Have there been any "Is this a scam?" questions that the answer was "No"? 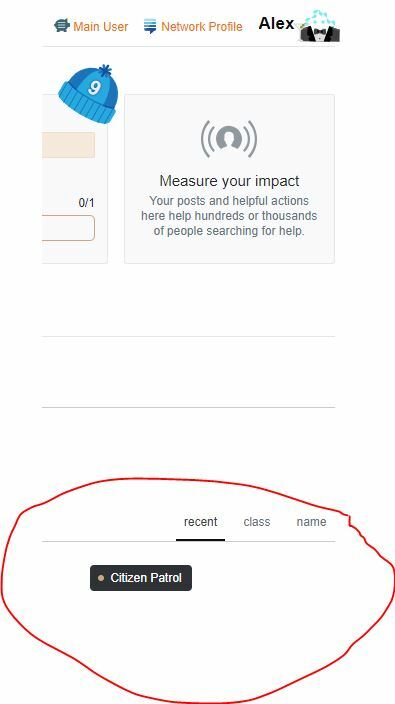 Now you might think that I'm simply misremembering flagging the post. 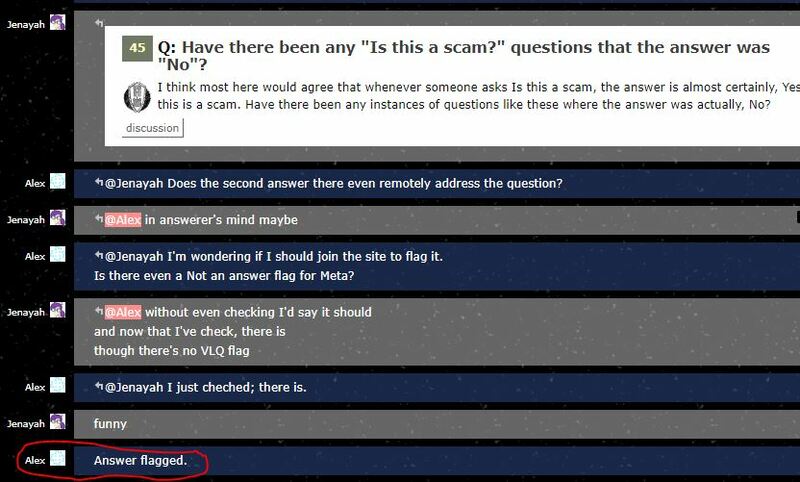 However, this post was discussed in another site's chatroom, and there are several comments there from me indicating that I flagged it. 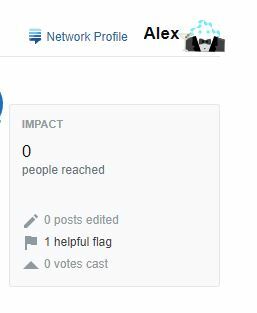 Now of course it is theoretically possible that I claimed to have flagged it and then went back a few days later and claimed that the flag was declined, but none of it had actually happened. However, even if we don't trust that line of evidence, there is other evidence that can be adduced here. So I clearly have raised at least one flag on the site. 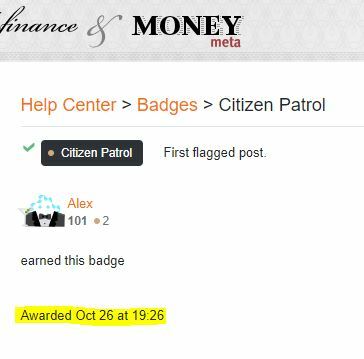 So, to summarize, I have comments indicating that I raised a flag, I have a badge indicating that I raised a flag, and I have a flag notice indicating that I raised a flag... yet my Activities page does not show any flag history. If you have no other history on the site, this history section will only display once you get at least one helpful flag. Since your flag was declined, it doesn't count, and the section won't display. 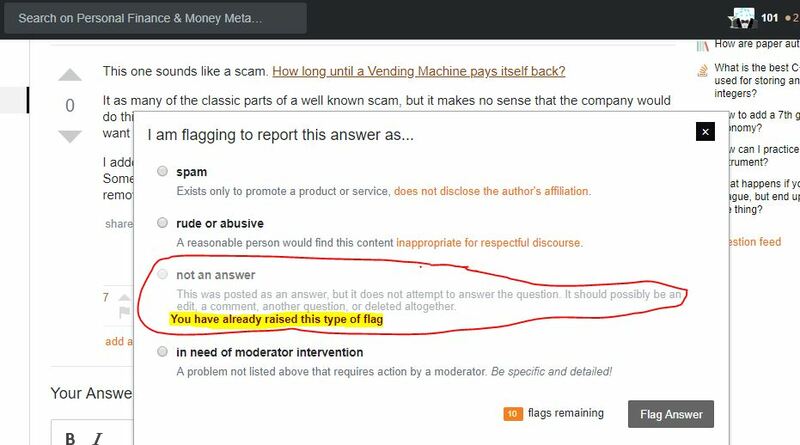 You can still view your flag history on Money at https://money.stackexchange.com/users/flag-summary/78372, and the declined flag will show up there. Not the answer you're looking for? 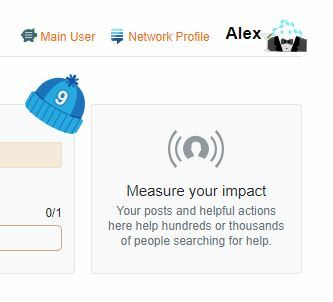 Browse other questions tagged support flags activity . Can we have a way to undo a flag? Am I using the “Invalid Flag” flag wrongly?